The building was erected at the beginning of the Twentieth century as an elementary school which was attended by sculptor Berto Lardera and donor Giorgio Cozzani. During the Twenties the building housed the Civil and Criminal Courts; it underwent the bombings of '43 and was rebuilt in the immediate post-war period. Since 1994, when the Courts moved, it remained unused up to when it was destined to house the civic collections of modern art. 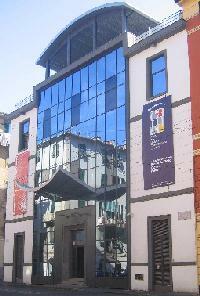 The present building is the result of its radical transformation by Chiara Bramanti, an architect of the Commune of La Spezia. Its facade is a spacious reflecting glass surface; the top floor is used as partly covered terraces. In correspondence with the inner court a semicircular grand staircase was built, together with a panoramic lift. The three levels and the terrace were inaugurated in May 2004; each of them can hold mountings 400 linear metres long, and a total area of 1500 square metres. "Courtesy of CAMeC. Text & photos reprinted with permission."